The best 2-in-1 laptops combine the top features of laptops and tablets for creative work. The best 2-in-1 laptops are ideal tools for modern digital creatives. They offer some of the top features found in both laptops and tablets. So, you get powerful hardware that can run full versions of creative software such as Photoshop, while also offering responsive touchscreen, as well as thin, light and portable designs that you'd normally associate with tablet devices. When you're looking to buy the best 2-in-1 laptop for your needs, there's a few things you should bear in mind. First of all, there are two main types of 2-in-1 laptop. First, there are 2-in-1 laptops that turn from a laptop into a tablet by physically removing the keyboard. These are usually much thinner and lighter devices when used in tablet mode, but it does mean you need to store the keyboard carefully when it's not being used. Some 2-in-1 laptops with detachable keyboards have two batteries – one behind the screen and another in the keyboard. This offers longer battery life when in laptop mode. The other popular form for 2-in-1 laptops features a hinge that can flip the keyboard 360 degrees so that it is behind the screen. As the keyboard remains attached, these 2-in-1 laptops are usually a bit thicker and heavier than 2-in-1 laptops that have removable keyboards. However, you don't have to worry about stashing an unused keyboard anywhere, and the hinge allows you to use the laptop in a variety of different ways. For example, you can flip the keyboard 90 degrees, and use it as a stand, which makes it useful for watching media on, or for presentations. The best 2-in-1 laptops also come with styluses which can be used with the touchscreen. This turns them into excellent digital drawing pads – again, making them ideal devices for digital creatives. This year's model of the HP Spectre x360 13-inch is our pick for the best overall 2-in-1 laptop money can buy right now. 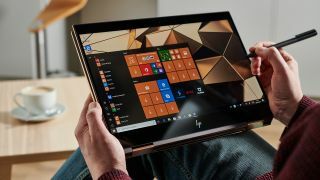 HP has given its flagship 2-in-1 a redesign, making a lovely looking laptop even more desirable, and there has been a few tweaks to the hardware to ensure it's one of the best performing 2-in-1 laptops in the world as well. It is expensive, but for the money you get a stunning device – and it comes with a stylus included for digital drawing. If you're looking for the best high-end 2-in-1 laptop, then Dell's powerful XPS 15 2-in-1 is the one to get. While this is an expensive device, Dell has packed it with some serious horse power, including a discrete AMD Radeon RX Vega graphics card. This offers excellent performance with graphically intensive tasks, such as creating complex digital art, editing photos and rendering animations and videos, all while offering a fantastically versatile 2-in-1 design. The Asus Chromebook Flip is our pick for the best budget 2-in-1 laptop in 2019. It uses Chrome OS, rather than Windows 10, which means not all digital art programmes are available, but now that you can run Android apps on Chromebooks, you still have a huge selection of apps for drawing, photo editing and more. The price is hard to beat, and it also has an impressively long battery life as well. If you want a cheap 2-in-1 laptop, this is the one to get. When looking for the best 2-in-1 laptop for drawing, then you want something that has a nice big screen, along with plenty of graphics power to do your doodling justice, which is why we've picked the 15-inch version of the Microsoft Surface Book 2. Its large and vibrant screen gives you a great canvas to get drawing on, and the Nvidia GeForce GTX 1060 graphics card means it is easily powerful enough to cope keep up with any brushstroke. You'll want to use Microsoft's excellent Surface Pen with this for the ultimate drawing experience, but annoyingly, it's not included with the laptop, so you'll need to factor it into your budget when buying this 2-in-1. Lenovo's Yoga line of 2-in-1 laptops are some of the best in the world, and the new Lenovo Yoga 920 is our choice for the best 2-in-1 for photo editing. This is because it has a simply gorgeous IPS display that showcases your photos, and if you go for the 4K model, you'll get to see your photographs in perfect detail, which is ideal for editing. It has plenty of power for photo editing, including a modern Intel processor with Intel UHD Graphics 360, and you can configure it up to 16GB of RAM, making this a very capable 2-in-1 laptop for photo editing. The 13-inch version of Microsoft's Surface Book 2 is our pick for the best 2-in-1 for video editing. This is because you can configure it to have a powerful Nvidia GeForce GTX 1050 graphics card, which can easily cope with video editing, while its 3,000 x 2,000 PixelSense display gives you a gorgeous screen to see your movies as you edit. It can come with a 1TB hard drive, which is useful for storing large video files, and the 13.5-inch size means you can easily and conveniently carry it around with you if you like to work on the road.